FAMOWOOD Latex Wood Filler has the same outstanding qualities of Original FAMOWOOD, but has very low odor and can be cleaned up with water! FAMOWOOD Latex Filler spreads easily and requires very little sanding to achieve the desired finished look. 1.For best adhesion, cracks or defects should be clean and dry. 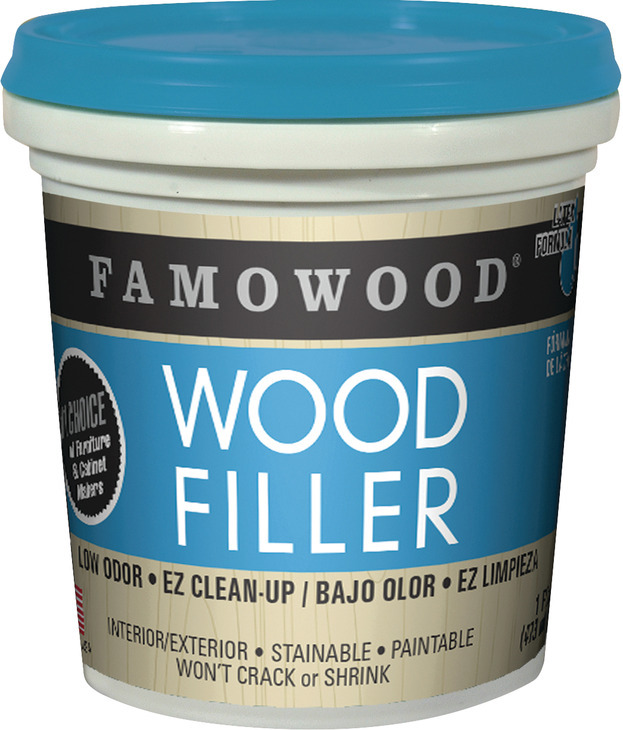 Is FAMOWOOD Latex Wood Filler easy to use? Yes. FAMOWOOD Latex requires no mixing; spreads smoothly and evenly into small or large holes, cracks & defects in unfinished wood. How long does it take for FAMOWOOD Latex Wood Filler to dry? FAMOWOOD Latex Filler dries in 15 minutes. Once dry, it acts just like real wood and is ready to sand, saw, stain, nail, paint or plane. What makes FAMOWOOD Latex Wood Filler unique? FAMOWOOD Latex Filler has a high solid content of wood flour and takes stains and paints like real wood because it is made of real wood. Will FAMOWOOD Latex Wood Filler shrink or crack? No. FAMOWOOD Latex Filler shows no signs of shrinkage, cracking or crumbling and can be used indoors or outside, making it ideal for any custom projects.